ArticlesOnTap.com, one of the webs premier content marketing firms, has announced that they will be working with TheLittleThingsAre.com in preparing their site's content management. Early chapters provide a brief overview of the history of the low carbohydrate diet and its alternative the low fat diet. ArticlesOnTap.com, one of the webs premier content marketing firms, has announced that they will be working with TheLittleThingsAre.com in preparing their sites content management. While growing in popularity, the low carb diet even to this day continues to remain controversial, this is bringing a lot of new readers to the subject matters website. In her recently published book "It Really Is The Carbs: Why Nobody Wants to admit that Low Carb is the Only Diet That Works" health and fitness blogger Kasia examines the roots of this ongoing controversy and attempts to bring the story to life through the first hand account of her close colleague who took up the low carb diet when it was at the low point of it's popularity. This personal story is intertwined with a broader background narrative that provides context and reveals the circumstances that led to the low car diet falling into disfavor. Early chapters provide a brief overview of the history of the low carbohydrate diet and its alternative the low fat diet. This story is told from the perspective of the key personalities that have been informed on this ongoing debate. Dr Robert Atkins is shown as the leading proponent of the low carb diet in this century. Dr Ancel Keys is described as the researcher whose findings formed the basis of the rationale for a low fat diet. Gary Taubes is highlighted as the science writer who revitalized the low carb movement with a series of thought provoking books and articles. The final chapters examine key media events that served to contrast the positions of low fat diet advocates and defenders of the low carb diet movement. The author claims that the tide is starting to turn for the low carb diet movement in the context of a new emerging diet movement called the paleo diet. In her concise book Kasia says " We hope this story will help you in understanding the political and historical context of the effort to validate the benefits of the low carb diet and the key figures and personalities that have shaped the debate over the preceding decades"
The book "It Really Is The Carbs: Why Nobody Wants to admit that Low Carb is the Only Diet That Works" is now available through Amazon.com in kindle formats. During the official launch from May 4th through May 8th, 2013 the book will be available for free in digital format for kindle readers. 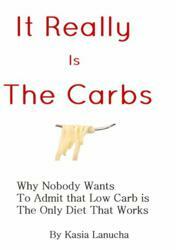 Kindle copies are available at http://www.amazon.com/It-Really-The-Carbs-ebook/dp/B00BVYTWJE. Visit http://TheLittleThingsAre.com for more information.